fashion | Listen Up Ent. Adidas has filed a lawsuit against Forever 21 for counterfeiting and violating trademark laws. For decades Adidas has placed the 3-stripes striping on clothing and footwear and has invested millions of dollars building its brand in connection with the ‘three-stripe mark”. Adidas claims (the photo above) are examples of the identical or confusingly similar imitations of the Three-Strip Mark. The lawsuit claims the merchandise is “likely to cause confusion, deceive the public regarding its source, and dilute and tarnish the distinctive quality of Adidas”. Rihanna’s Kadooment Day Parade Costume Takeover! Bad Gal RiRi was the life of the party at this years Kadooment Day Parade. Wearing a zulu styled bikini costume atop a float at the Carnival-like day celebration in Barbados, Rihanna was living it up with a cup in her hand and some twerking in those hips. RiRi sure knows how to party. Move over Sleeping Beauty and Cinderella, there’s a new princess in town and she’s starting some beef, literally. 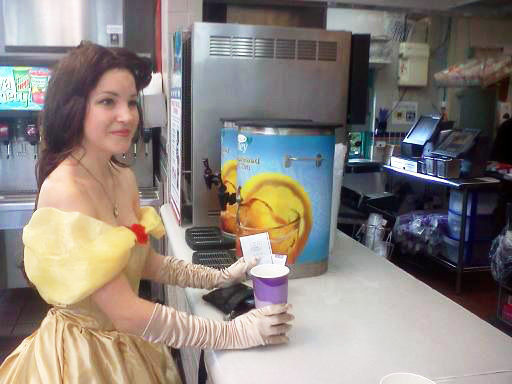 “Taco Belle” was spotted at Taco Bell in her full on taco princess gown placing an order over three years ago 24 year old Olivia Mears was dressed up as Belle inside of Taco Bell and next thing you know she went viral. Now Mears has relived her Belle at Taco Bell experience by creating a full on custom made taco princess gown. She estimates the costume took around 30 hours to make from fabric, cardstock, tissue paper and felt. “I have as much as everyone else, I just hate being bored. I’ve always got at least three costumes/artworks I’m working on at any given time,” she said. Are You Feeling JLo’s New Short Hair?!?!?! Jennifer Lopez displays her new look on Instagram. Cutting off her long locks, JLo is embracing her current hair style, #ShortHairDontCare. On Monday, Gap said it will close out 175 Northern American stores also a “limited number” of Gap stores in Europe over the next few years. Gap executives will give more details on the changes in an investor meeting on Tuesday at 9 a.m. PST.